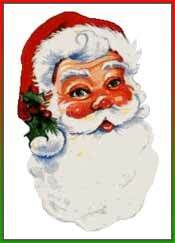 Santa Clause has helped people get fascinated and enchanted by the nurturing, age-old myths and fables of their culture. Santa Claus has been successfull in engaging a young child's sense of wonder through his unique characterizations. Some of his awe-inspiring feature that fascinates are: he is virtually omnipresent and can visit hundreds of millions of homes in one night. He monitors each child; he is all-seeing and all-knowing; he knows when they are bad and good. He gathers gifts for hundreds of millions of children, and deliver them in one night. Though the essence of Santa Clause is same in every countries, various attributes are added or reduced in his description according to the culture and tradition of the country. Once the Dutch brought Saint Nicholas to America, he was gradually transformed from an austere bishop to a jolly old elf. Here, the saint was transfomed as a plump and jolly old man bringing gifts. The jolly, ruddy, sack-carrying Santa with a red suit and flowing white whiskers had become the standard image of Santa Claus in America. In Germany, Nikolaus is usually celebrated on a small scale. Many children put a boot, called Nikolaus-Stiefel, outside their front doors on the night of December 5 to December 6 . St. Nicholas fills the boot with gifts, and at the same time checks up on the children to see if they were good. If they were not, they will have charcoal in their boots instead. Swedish children wait eagerly for Jultomten, a gnome whose sleigh is drawn by the Julbocker, the goats of the Thor, the god of thunder. He dresses in red and carries a bulging sack on his back. In Denmark the gift bringer, Julemanden, also carries a sack and is drawn by reindeer. Elves called Juul Nisse are said to come from the attic, where they live, to help Julemanden. Children put a saucer of milk or rice pudding out for them in the attic and hope to find it empty in the morning. For small children in the Netherlands, Sinterklaasavond (St Nicholas evening) is much more important than Christmas. In recent years, some Dutch have started to celebrate Christmas Eve with Santa as well. On the evening of December 5, Sinterklaas brings presents to every child that has been good in the past year. Sinterklaas wears a red bishop s dress including a red mitre, rides a white horse over the rooftops of houses and is assisted by many helpers with soot black faces and colorful Moorish dresses, dating back two centuries. Typical presents include the first letter of the child's name made out of chocolate, a figurine of Sinterklaas made out of chocolate and wrapped in painted aluminum foil, colored marzipan shaped into fruit, an animal or some other object. In Syria children's gifts come from the youngest camel on January 6th, which is Three Kings Day. In Spanish speaking countries such as Mexico, Puerto Rico, Argentina , Brazil, the Philippines and Spain, the Three Kings, themselves, give the gifts to the children. In Russia the same ageless wanderer is called Baboushka. She gave the wise men the wrong directions and on the eve of Three Kings Day she wanders from house to house, peering into the faces of children and leaving gifts. Russia also has Grandfather Frost. English children wait for Father Christmas, known to their ancestors as Christmas itself. In France gifts are also brought by Father Christmas, Pre Noel, or the Christ Child himself. In Austria and Switzerland the Christkindl bears gifts. In some towns Christkindl is a beautiful girl-angel sent down from heaven to give gifts.